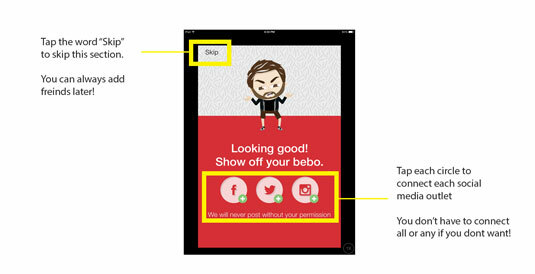 After opening the application from the device’s home screen or app drawer, you are presented with a general video on what Bebo is and how to use it. Watch the “See how it works” video. Afterward, an opening graphic shows a group of Bebo characters (see the right side of the image). A Login and Register button are below the characters. Choose Register. 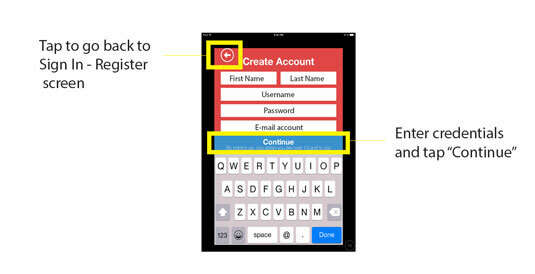 After tapping the Register button, you are presented with a Welcome screen, asking for your first and last name as well as your desired username, password, and email. Enter all pertinent information and tap on the blue Continue button. If all the information you entered is correct and hasn’t already been taken by another Bebo user, you are able to continue to the next step. The first of the avatar presets to choose from is the gender category; choose either male or female by tapping on the symbol associated with the gender of your choice. After you’ve selected the gender of your avatar, check out the grey icon area. Each category, such as hair, eyes, skin, clothing, and so on, offers you various selections in style and/or color. Customize your avatar by making the style and/or color selections that appeal to you. Then select the checkmark in the top right corner of the app. Choose a pose that is relevant to you. There are many poses to choose from, including some funny poses such as #BreakingBad, #HighMaintenence, or #MorningCoffee. 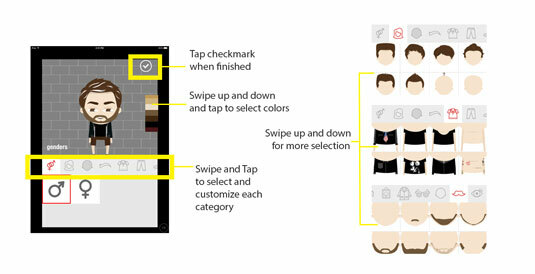 After you have chosen the pose that best represents your mood and style, tap the checkmark in the top right corner. Connect with Facebook, Twitter, and Instagram. Tap on the three circles in the middle of the screen to connect with the social media outlets of your choice. This is only to collect contact information, so the Bebo application can look for other Bebo users for you; Bebo is not able to message your Facebook or other friends directly. Messaging is only capable between two Bebo users, no outside sources are allowed, since the app requires an avatar for hashtags to function correctly. You can choose to skip this step if you are looking to try out the application prior to adding friends; select the word skip in the top left corner of the Connect screen. Now that you are done connecting your friends to Bebo, you are presented with an opening screen that shows a list of contacts and their current status as well as an initial message thread from Team Bebo. 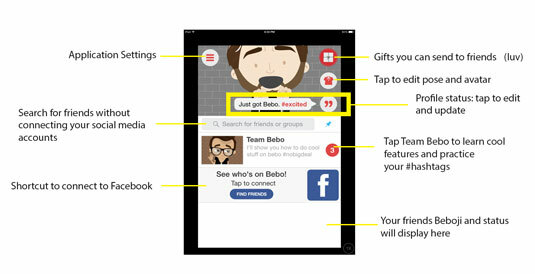 If you chose to skip connecting your social media accounts, you are presented with Team Bebo and a message to connect your Facebook as indicated. 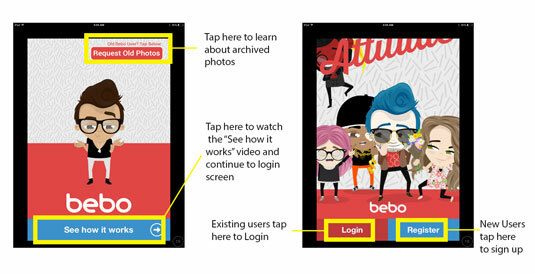 On the top of your screen is a graphic of your Bebo avatar in the excited pose, since the first status message is already populated for you Just got Bebo #excited. To change your pose and status, tap the status bubble and type a new phrase along with the pose hashtag you desire. If no hashtag is included in your status message, then the default pose you chose when setting up the avatar is selected. Now you are ready to Bebo! 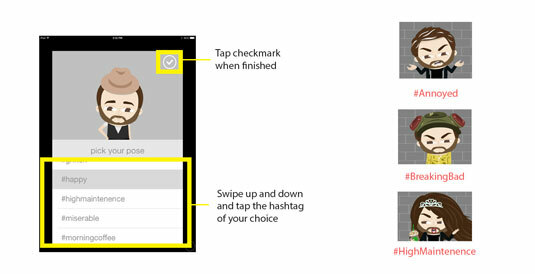 If you are new to using hashtags, practice a few with Team Bebo before you start messaging your friends.